Playgro Rock 'N Stack Just $4.79! Down From $9! You are here: Home / Great Deals / Playgro Rock ‘N Stack Just $4.79! Down From $9! Playgro Rock ‘N Stack Just $4.79! Down From $9! Right now you can get this Playgro Rock ‘N Stack for just $4.79 (Reg. $9) at Walmart! Stimulate your baby’s senses with the Playgro Rock ‘N Stack. It features a rainbow of five teeth-able rings that fit over a cone. The rocking base makes it easy for your child to grab and move this item while increasing gross motor skills. Each ring in this baby learning toy is a different size, and they each have a textured surface to help build tactile development while increasing counting and cognitive development. They are all individually and brightly colored to help stimulate visual perception. 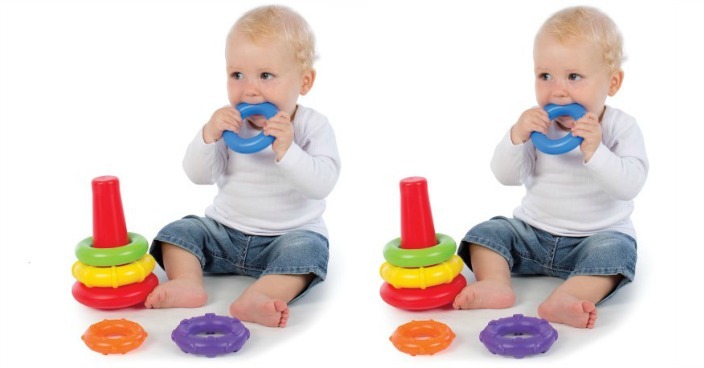 Each ring in this baby stacking toy can be removed and re-stacked to keep little ones entertained for many hours during playtime.